New to this shop? Click here for a quick overview. This is a modern, good looking 3-way mixer tap tap that combines modern styling with ceramic disc technology. 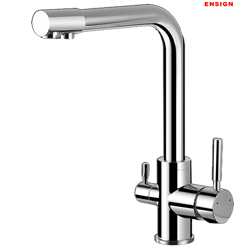 Metal construction throughout Ceramic disc operation Left hand handle for filtered or hard water Right hand multiport for hot and cold water Available in chrome. 10" Superior Carbon Block replacement filter cartridge. Suitable for taste and odour reduction and particulate matter down to 5 micron in drinking water applications. Fits standard 10" filter housings.